Many people, including Christians, struggle with life issues that impact their lives in a negative way. For this reason, many people seek the advice of a counselor for help with these issues. However, despite the large number of counselors who call themselves Christian counselors, few actually use the Bible as part of their counseling and rely upon man-made counseling methods, which produce man-made results. This leads many people to wonder how to find a good Christian counselor. 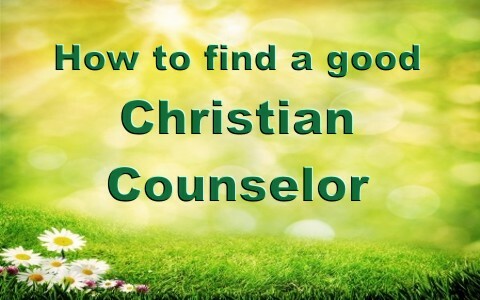 Why should Christians seek a good Christian counselor? The Bible tells us that counseling is important and that it should be done by someone who is a believer that sees the importance of their faith when they provide counseling. Unfortunately, many counselors who call themselves Christian counselors do not base their counseling on methods that are based on Christ-centered principles. Why is it important that God’s Word be used by a good Christian counselor? What are some things to look for when seeking a good Christian counselor? With these things in mind, seeking a good Christian counselor starts by seeking one that is Christ-centered in their method of counseling and uses the Word of God as the foundation of their counseling. In addition to these things, there are a few other things that a good Christ-centered Christian counselor will do. When it comes to a generalize approach to handling life issues, non-Christ centered counselors will promote evolutionary psychological, behaviorist, or humanist methods and beliefs when addressing issues concerning the nature of man. Christ-centered counselors will promote Biblical methods and beliefs when addressing issues concerning the nature of man. When it comes to questions about resolving issues from the past, non-Christ centered counselors will promote venting, shifting blame, or talk therapy as the primary approach. Christ-centered counselors will resolve issues from the past by identifying sinful roots of behaviors and responses and promoting forgiveness and reconciliation where needed. When it comes to questions about stress, non-Christ centered counselors will promote stress as the problem. Christ-centered counselors will identify the sinful reactions to stress as the problem. When it comes to anger non-Christ centered counselors will promote venting or blowing off stream as the solution. Christ-centered counselors will identify the sinful sources of anger and how to handle anger Biblically as the solution. When it comes to questions about changing behaviors, non-Christ centered counselors will promote the modification of standards to please self and others. Christ-centered counselors will promote change by the standards of God’s Word to become more Christ like and pleasing to God. When it comes to questions about bad habits, non-Christ centered counselors will promote bad habits as coping mechanisms learned to survive. Christ-centered counselors will identify the bad habits as a result of sin. When it comes to questions about listening and patience, non-Christ centered counselors will promote validating feelings above being right and encouraging to vent so they can help identify a solution through self-made mirroring practices. Christ-centered counselors will promote the Biblical principle of being swift to hear and slow to speak and encouraging the investigation the truth of the matter and confirming the facts without reacting in a sinful way. Where do you find a good Christ-centered Christian counselor? There are several places to find a good Christ-centered Christian counselor. The best place is by asking people in your church if they know of one that matches the previously described traits. If that does not work, try using the Internet to search for one using search terms such as: Biblical counselor, Christ-centered counseling, nouthetic counseling, or other terms that focus on counselors that use the Bible. Do they use the Bible extensively during their counseling and give God the credit for success? Do they take insurance. If they do take insurance, then the counseling is almost always not Biblical because they must use a psychological diagnosis code to bill the insurance company. The Bible does not have diagnosis codes. Do they accept donations? Accepting donations is allowable and encouraged Biblically to not only provide for the expenses of the ministry, but as a way to honor those who minister in the Word and doctrine (1 Corinthians 9:9-14; 1 Timothy 5:17-18). Do they believe in Pastoral/church accountability? Spiritual issues that are refused to be handled Biblically are supposed to be reported to the church (Matthew 18:15-20). Do they require people to attend church? While not required, this is a good practice as trying to deal with life issues without attending a church is like trying to heal from surgery by eating one meal a week. We are told in Scripture that we should be attending church (Hebrews 10:23-25). This helps us grow spiritually and reinforces what we learn. A good Christ-centered Christian counselor will follow what the Bible says about life issues and use the Bible when it comes to giving counsel. Asking your Pastor or people at your church or searching the Internet for Christ-centered counselors is a good place to start. Once you find one, ask them specific questions to determine if the counseling they provide is based on Biblical principles. Take a look at this related article: What is Biblical Counseling? Resources – Scripture quotations are from The Holy Bible, King James Version. Williams, Michael, (2013). Introduction to Biblical Counseling. Albuquerque, NM: Selah Mountain Bible Institute.